Rolling off an action-packed weekend/week from which I feel like I’m still not fully caught up yet. How’s your Monday going? 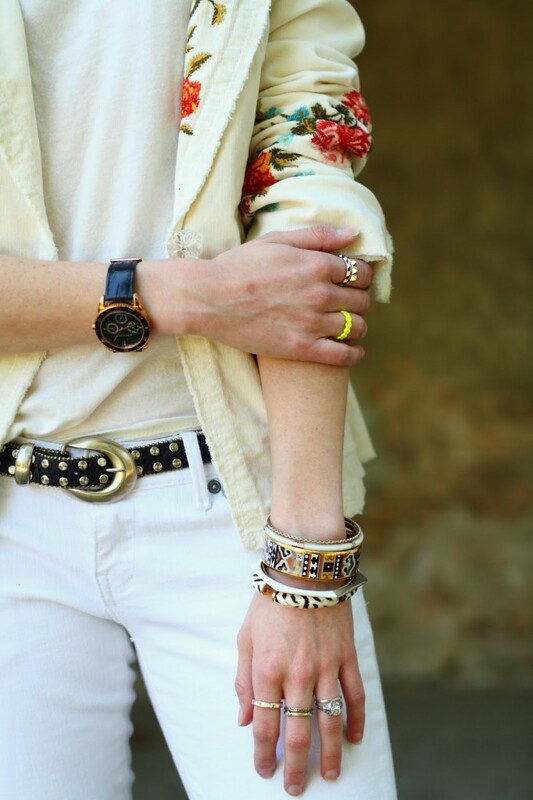 I love your piled on accessories – especially your neon ring! Same. I had two bday parties this weekend and it snowed today. Good thing you are wearing this awesome floral blazer! Is it embroidered? I love it! Happy spring! Ohh, that blazer is so pretty! A floral blazer is on my to-buy list! But obviously since you're so cool you already had one. I love how you brought out the flowers in your jacket with those amazing boots of yours. And all those rings and bracelets–swoon! Diggin that blazer with the red booties, they truly stand out with the neutral fit. Love this look! Super into all white for spring/summer and you pull it off so well. I especially love that little touch of neon on your finger! awesome look! the blazer is insane! Great look! The red boots are fantastic, remind me of Footloose!